The landscaping around this large, two-piece granite sculpture exemplifies the relationship of art and the environment. Given the artist’s concept and title, the tall seasonal grasses near the sculpture are especially appropriate. As you explore the campus (and take the Outdoor Sculpture Tour), you will see other examples of landscaping complementing art. 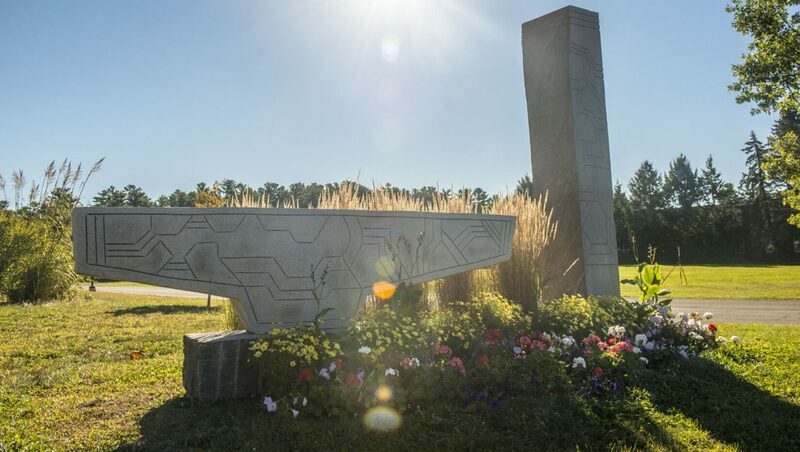 Line Totem was created during the 2012 Schoodic International Sculpture Symposium, held at UMaine, and draws on the Native American heritage of its Maine-based sculptor Tim Shay.